The point is well-taken because the most commonly used PA techniques are work better with larger data than "one of a kind" events. Micro risk can be quantified in a PA framework well. During the second day, an excellent talk described a fraud assessment application in the insurance industry. 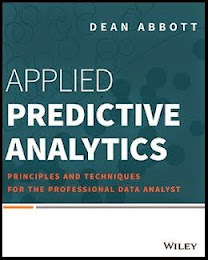 While the entire CRISP-DM process were covered in this talk (from Business Understanding through Deployment), there was one aspect that struck me in particular, namely the definition of the target variable to predict. Of course, the most natural target variable for fraud detection is a label indicating if a claim has been shown to be fraudulent. Fraud often has a legal aspect to it, where a claim can only be truly "fraud" after it has been prosecuted and the case closed. This has at least two difficulties for analytics. First, it can take quite some time for a case to close, making the data one has for building fraud models lag by perhaps years from when the fraud was perpetrated. Patterns of fraud change, and thus models may perpetually be behind in identifying the fraud patterns. Second, a there are far fewer actual proven fraud cases compared to those that are suspicious and worthy of investigation. Cases may be dismissed or "flushed" for a variety of reasons ranging from lack of resources to investigate, statutory restrictions, and legal loopholes which do not reduce the risk for a particular claim at all, but rather just change the target variable (to 0), making these cases appear the same as benign cases. Do you think would be possible to access to the complete and original presentation?